In October 2015 Shadow, Buster and I Adventured to Crown Point Fort in Crown Point, New York. The Fort is part of Crown Point State Historic Park. The Fort was originally built by the French titled Fort St. Frederic, and was in the French and Indian War and Revolutionary War. The State of New York acquired the Fort in 1910, and it is now open for visitors. The Fort is located along Lake Champlain, near the Vermont border. In October 2015 Buster, Shadow and I Adventured to the Samuel Champlain Memorial Lighthouse in Crown Point, New York. In July 1609 Samuel Champlain discovered the lake now known as Lake Champlain. An existing lighthouse was converted into a Memorial of the explorer in 1912, on the 300th anniversary of this discovery. The Monument is granite in material, and provides a staircase to climb for a spectacular view. The lighthouse was later deactivated as a bridge from New York and Vermont was constructed, and it was no longer needed. The Mounument is located on the grounds of the Crown Point Reservation. 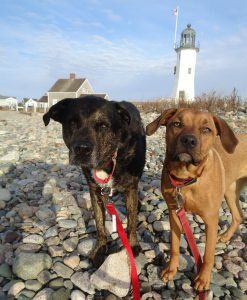 Shadow, Buster, and I had a wonderful Adventure to the Samuel Champlain Memorial Lighthouse, three years ago. I absolutely love sharing my Throwback Blog, however my memory is not quite as detailed of these Adventures. However I still have fond memories of our visit to the Monument. The sun was out and it was a gorgeous fall day. After spotting the Monument from afar we parked and took a long stroll over to the Monument. The Monument was beautiful, and photographed well with the Fall scenery. We walked around the Monument, and then down to the dock checking out the view across Lake Champlain, the mountains framing a bright blue sea. We sauntered around for a bit attempting to not miss a detail. It is especially an exceptional Adventure when we find one without planning. We were lucky to spot the Samuel Champlain Memorial Lighthouse on our travels today (Rating: 5). Today Shadow, Wilma, My Parents, and I visited Fort William Henry in Lake George, New York. Fort William Henry was a Fort of the British during the French and Indian War. It was built in 1775. Fort William Henry is known for the French siege in 1757 where the British were massacred by the Huron Tribe after be allowed to withdraw. The French later destroyed the Fort in 1757 after a successful siege. A replica was built for the filming site of the “Last of the Mohicans”, and is now a popular tourist attraction in the area. We had a very brief Adventure to Fort William Henry. It was a dark and gloomy, yet nice and cool Fall day at Fort William Henry. We began walking onto the Fort ground passing “soldiers” shooting off muskets. Parallel to these gentleman were historic camp scenes plastered with authentic costumes and colonial activities. We proceeded through the grounds and over to the water view with beautiful mountains surrounded Lake George. However it was then that canon demonstrations began from within the Fort. Although surprisingly Shadow did not seem too bothered, that soon ceased, and we headed away from the area to relax, before heading out. I am not sure if dogs would have been allowed into the actual Fort, but not sure if we would have been tempted by the sizable entrance fee. So a short visit, but glad to see some of the Fort ground before heading off on our next Adventure (Rating: 3). Quite Relieved to be Back in the Car, my sweet Shadow!